Darjeeling: Meetings between UNESCO and Indian Railway representatives will be held on November 20, 21 and 22 to discuss the Comprehensive Conservation Management Plan (CCMP) for the world heritage Darjeeling Himalayan Railways (DHR). The plan has been completed. A UNESCO team comprising experts has been preparing a CCMP for the DHR since 2016. The project involved survey, documentation and dialogue and took into consideration institutional management, finances, legal and technical aspects. Over the years, the value of the heritage railway has been steadily decreasing, caused by rampant encroachments, unplanned constructions along the tracks blocking the view and dumping of garbage. "We will be holding a meeting with Railway authorities on November 20, 21 and 22 at the Elysia Building, DHR headquarters, located in Kurseong. The plan has been completed but the implementation part needs to be discussed. We will table the report and discuss with the authorities the steps required to safeguard this world heritage site and to how to sustain it," stated Abhisekh Sonar, an architectural expert who is part of the UNESCO team, while talking to Millennium Post. DHR was inscribed as a world heritage site on December 2, 1999. On Tuesday, it commemorated the World Heritage Week. World Heritage Week is celebrated all over the world from November 19 to 25. It is celebrated mainly by the students of schools and colleges, in order to make people aware about the importance of heritage sites and their preservation. 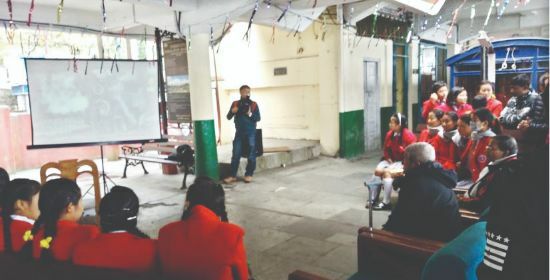 Apart from taking students for a joyride from Darjeeling to Ghoom and back, a community workshop was also organised at the Darjeeling Railway Station. "The workshop includes a UNESCO presentation of 52 slides. This presentation is given in schools, specially in far flung areas. Students are sensitised on different categories of heritage, importance of heritage and the need to preserve heritage," stated Nitin Giri, specialist, UNESCO. The need for community participation for preservation of the world heritage site was discussed. The history of DHR was part of the presentation as well, including freight trains, postal mail, ambulance train and the trolley. Rabgay Rai, a 3rd year student of Darjeeling Government College who had taken part in the celebrations, stated: "The DHR carries our history. Slowly, the community is becoming aware of the importance of this world heritage site. Students are coming forward now. It is our responsibility to preserve it." In the year 1879, work first started on DHR, then called the Darjeeling Steam Tramways. The stretch from Siliguri to Kurseong was opened on August 23, 1880, while the Siliguri to Darjeeling track was inaugurated on July 4, 1881. The name of the rail company was then changed to Darjeeling Himalayan Railway Company. The DHR covers a 88 km stretch from Darjeeling to New Jalpaiguri. It starts at 398 feet at New Jalpaiguri in the plains and climbs up to 7,407 feet at the highest point in Ghoom. Meetings between UNESCO and Indian Railway representatives will be held on November 20, 21 and 22 to discuss the Comprehensive Conservation Management Plan (CCMP) for the world heritage Darjeeling Himalayan Railways (DHR).